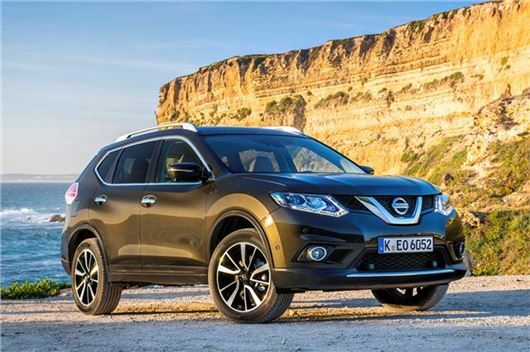 UK Car Discount has discounts on brand new Nissan X-Trail vehicles, with savings of up to £3100. Buyers will be the first registered keeper and order books are open now. All vehicles are UK dealer supplied with full Nissan warranty and are delivered free in mainland UK. UK Car Discount is one of the UK’s leading online new car dealers established over ten years ago, the company has sold millions of pounds worth of brand new cars. The new 2014 Nissan X-Trail Visia models feature 17” alloys, chrome exterior door handles and glass surround, front and rear power electric windows, air con with pollen filter, HD colour touch screen, drive computer, starts/stop system, cruise control, and a host of safety features. *The Smart Vision Pack includes Anti Dazzle Mirror, Traffic Sign Recognition, Lane Departure Warning, Forward Emergency Braking and parking sensors. The new 2014 Nissan X-Trail Acenta model adds the following to the Visia model: Rear privacy glass, leather covered gear knob and steering wheel, panoramic roof, automatic lights and windscreen wipers, dual zone climate control, front and rear parking sensors. The new 2014 Nisan X-Trail N-Tec model adds the following to Visia and Acenta models: 19” alloys, 360 around view monitor, colour reversing camera and start push button. The new 2014 X-Trail Tekna model adds leather trim seats, heated front seats, intelligent park assist, electrically adjustable driver and front passenger seats. More X-Trail models are available visit www.uk-car-discount.co.uk for more deals and full specifications.